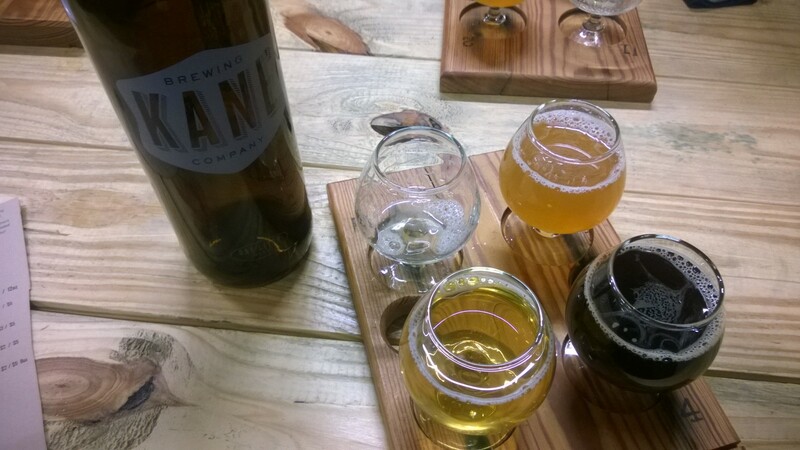 Kane Brewing in Ocean Township is probably the largest, at least as tasting room space. There’s a smaller bar as you come in, which opens to a large hall with plenty of picnic-style tables, where they also have stored dozens of barrels and kegs. They can comfortable fit almost 100 people (and it’s half open to the outside in the summer). Head High (6.4%) – a West coast-style IPA, with lots a fruit flavors, which was my favorite, and ended up filling my growler with it. Overhead (8.2%) – very hoppy Imperial IPA, which is not my style, but got good reviews from other people in our group. Single Fin (4.8%) – a light session Belgian Blonde, with easy to drink flavors. I think we should’ve started our tasting with this. Solitude (9.5%) – strong Belgian, a darker beer (almost stout-ish) with strong sugary flavors. I liked it, those others didn’t (I actually traded my Overhead sample for one of these). Next, we headed down to Atlantic Highlands for one of Jersey Shore’s best known breweries – Carton Brewing. They’ve grown a lot since the first time I went there 4-5 years ago. They have all fermenting barrels downstairs, and a nice tasting room upstairs with comfy couches, but I think they’ve overgrown this setup. It was a winter weekend and it was packed, you could barely move around… They definitely need to rethink their tasting room design. Boat (4.2%): This is their staple beer, a light pale ale that’s easy to drink. BDG (6%): Strongly-flavored country ale, it’s a nice beer to have while eating. It’s not the light session brew, but something you have to taste and enjoy. Red Rye Returning (6.2%): A rye pale ale with very nice spiced flavors, I really liked this one. Carton Canyon (6.4%): It’s stronger Southwestern-style lager. Tastes real good, and there’s a mix of hops in it that gives it a pilsner flavor without becoming too heavy. Carton was boasting the Gilded Lily, a 10.6% trupfel, which I really wanted to try, but this far into our tasting Marathon I had to give up and save the chips for another time. Dunkel (5%): an easy-to-drink but flavored German lager. Pro Multis (9.4%): heavily flavored and hoppy tripel, the perfect conclusion to our tasting tour. I have to appreciate the variety of craft breweries in such a small area, the Coastal Monmouth County. They are mostly small batches that you’d rarely find bottled at the liquor store or even in bars, but the rarity makes them even better and worth the trip. Almost all of them do tasting Saturdays afternoons, sometimes Sunday too and Friday evenings but you’d have to check their websites or Facebook pages to get up to date schedules. 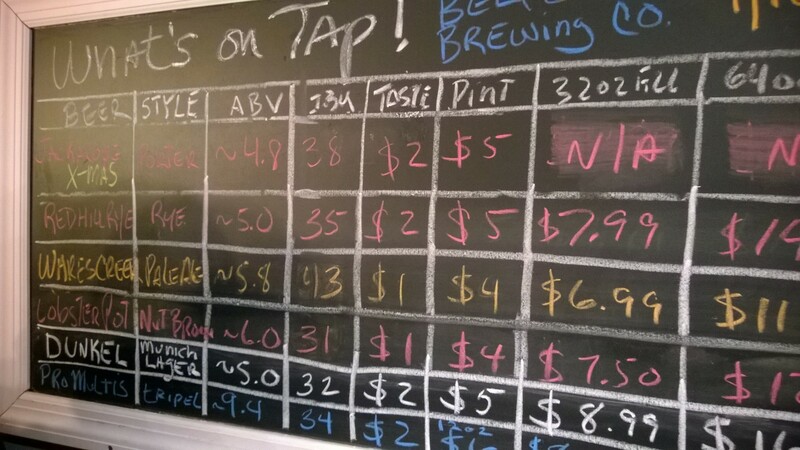 This is a report in progress so stay tuned for more about the craft beers of Monmouth County! You must have ended up these places in the short post-christmas low availability time. We frequent all three breweries and usually there is a TON of selection at all three! Also Carton does have locked in plan to move in the next year I believe as they have outgrown the tasting room space! We’re lucky to have so much good beer right in Monmouth county!!! Ann, I agree it must be the season. I’ve been to Kane in the summer/fall and there are a lot more offerings. And good to hear about Carton, I know they own the other building next to them.